Intervogue is a geometric sans serif typeface created by Richard Miller and published by Miller Type Foundry which is available in two widths (Regular & Alternates) each with 7 weights (from Thin to Ultra) and italics, useful OpenType features and multilingual support. This versatile font has a classic look but a modern touch and it merge well on any kind of project. Make history with Intervogue! 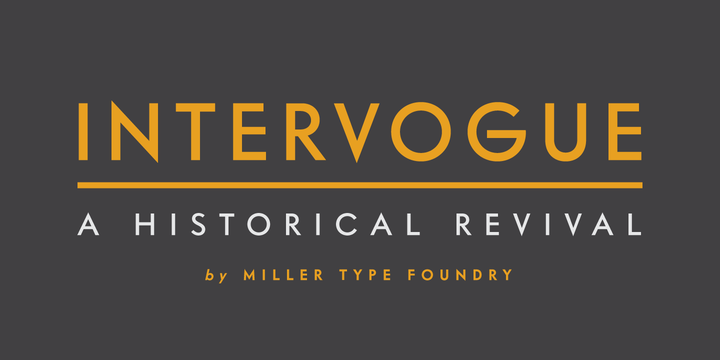 Note: “Intervogue” is a trademark of Miller Type Foundry. Price: starting from $25,99 for one font to $199 for all 28 fonts. A font description published on Wednesday, March 14th, 2018 in Fonts, Miller Type Foundry, Richard Miller by Alexandra that has 2,021 views.